Dentures are a prominent method to improve your oral health and teeth. To help you get accustomed to dentures, here are some very helpful and important tips to be aware of when you’re fitting in dentures for the first time. It can be daunting, but these 5 helpful tips will make you feel more comfortable when fitted, to show them off in public with that beaming smile! 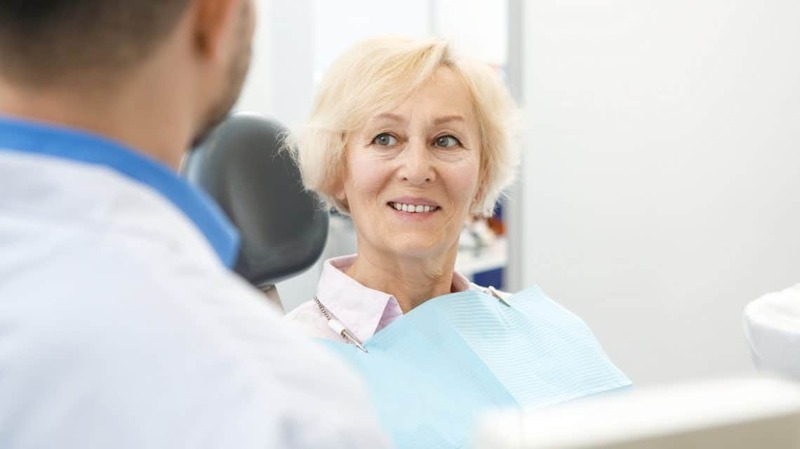 The Look and Feel – When dentures are fitted in by your dentist, you will report a “full-mouth” feeling which may feel that your dentures are too big for your mouth. Within time, this will disappear. A small amount of denture adhesive could be prescribed by your doctor for a more secure feeling with your denture. Although the adhesive will slowly ease the denture into its natural place, it is not recommended to continuously use the adhesive until you feel comfortable with it. For more tips on better comfort, consult your dentist if the adhesive doesn’t work. Speaking Confidently – A big worry for new denture patients is how they will speak, and how they will look while speaking. Wearing dentures improves self-confidence with strong adhesives, but your dentures will click when you speak. Whilst Dentures form itself back into place, keep your lower denture in place with the use of your tips, tongue and cheek, or bite down gently and swallow before talking to maintain its position. Rest assured, it is only expected that the speaking-awkwardness is to last at least two weeks after fitting, before slowly forming itself into place for you to speak normally. Keep your Dentures Clean Regularly – Something which can be easily neglected is to maintain the cleanliness of your dentures. It is recommended that a soft toothbrush is used to softly clean the denture and the surrounding area and refresh your mouth with alcohol-free mouthwash. How to Eat with Dentures – Chewing will naturally feel very different with new Dentures in place. Your taste buds will diminish, which means difficulty sensing between hot and cold foods. To start with, adopt a liquid diet with softer foods such as soup, eggs and puddings. When dentures will eventually become stable and you should chew slowly & thoroughly on both sides of your mouth. All food should be finely chopped, especially when you eat solid foods. You will eventually be able to eat anything and everything but be sure to eat softer foods than natural. Avoid sugar sweets, coconut, seeds or gum that require regular chewing. Keep the Bacteria Away – Dentures are not real teeth, but that should not stop you from regularly brushing and flossing your teeth. Dentures can easily form bacteria and tartar if not regularly cared for. Brush your gums and tongue with a soft toothbrush before placing your dentures in.